TORNADO Digital Radio Controllers from MicroLAB Systems are designed for real-time multi-channel RF-signal processing with on-board DSP and feature unique combination of accuracy, performance and system integration capabilities. 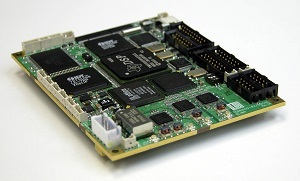 They can be used either as stand-alone embedded controllers with built-in external host communication interfaces and powered from a single wide range power supply, or can be a part of integrated system installed onto and hosted by either TORNADO-E2 DSP controllers or TORNADO-HCX host communication controllers. Finally, the number of synchronously processed RF channels can be easily increased by means of synchronization links across several boards. TORNADO Digital Radio Controllers use TI C6xxx DSP and TI/Graychip digital-down converters (DDC) for RF-signal processing. They come with comprehensive software utilities and ready-to-run demo samples.